Who is a good Jew is a question most people would understandably be nonplussed about. Some would be suspicious about the premise behind the thought. Others, rabbis perhaps, may well give a learned exposition about a righteous way of life and observance of the commandments. But to the left-wing supposedly anti-racist types who usually raise it, there can only be a binary response and the idea of the “good” Jew is a very precise one. Good Jews are anti-Zionist. Which leaves Zionists as the villain of the piece. Just last week, former Labour and Respect MP George Galloway took to Twitter to call comedian David Baddiel “a vile Israel fanatic”. 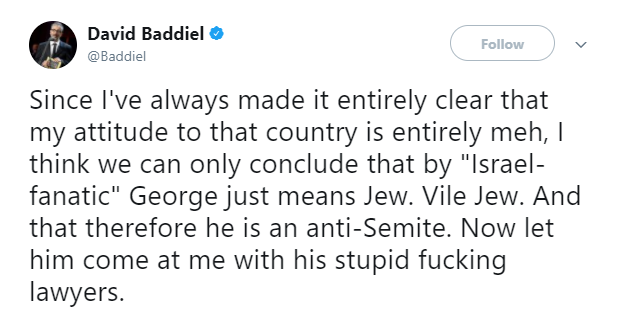 In an indignant riposte, Baddiel highlighted that his attitude to Israel has always been “entirely meh” and stating that Galloway really meant “Jew, vile Jew” by making a presumption of his politics because of his faith. To Baddiel’s defence came Momentum founder, Jon Lansman, seconding that Galloway’s depiction of the Jewish comedian was in his view anti-Semitic given that Baddiel is a Jew “who’s talked about being non-Zionist”. An example occurred just last month. Amnesty International UK was due to host a Jewish Leadership Council event about Israel at the United Nations, only for it to be unceremoniously cancelled a few days beforehand. Despite months of planning and discussions at all levels of seniority, Amnesty’s official reasoning at the eleventh hour was that it was felt inappropriate to host an event “by those actively supporting settlements”. Amnesty’s claim was false. The JLC supports a two-state solution and has never taken a position on settlements. Amnesty could find no statement to contradict this so cited our (very public) opposition to United Nations Resolution 2334 – which we stand by – as “evidence”. and all human rights are worth defending”. It appears that only Jews are subjected to a political test. As a result, is it any surprise that many Zionists try to downplay their pro-Israel credentials to stand in good stead with so-called progressives? They learn the hard way that unless they completely disavow Israel, they will be shunned. In reality, such people are not progressive but regressive and there is no reason to seek their approval. While criticism of Israel’s policy can be legitimate, abjuring its very existence can never be. If stating this makes me a bad Jew, it’s a label I’ll wear with pride. This article first appeared in the Jewish News on 8 February 2018.